Dan Matthews (Watkinsville city council). As our State Committee Member, Angie Eells gave a report on the activities of the Committee in February and March and submitted them to Pam Davis, Secretary. Affiliates were recognized: Whit Lill representing the Young Democrats Of Oconee High School. Guests were welcomed by the Chair and asked to introduce themselves and name the county in which they lived and their particular interests as Democrats. Deborah Gonzalez, who is an Attorney, is considering running against Regina Quick in 2018. She spoke briefly about her goals and visions. Whit Lill from the Oconee County High School Young Democrats stated that they need two more members to be chartered. The Chair announced that the official business session of the meeting would begin in five minutes and that all present were invited to stay for the meeting if they wished. Most, but not all, guests chose this time to leave the meeting. Chair Angie Eells read and submitted a report of her activities in February and March. Secretary Pam Davis called for additions or deletions to the previously circulated minutes of the March 17, 2017 Business Meeting. Receiving none, she called for a motion to approve the minutes as submitted. Sarajane Love made the motion; it was seconded by Margaret Holt, and unanimously approved. Treasurer Robert Wyatt through Pam Davis informed the Committee of its current bank balance of $920.86 and reminded Members that she was still accepting dues not received since the due date of January 2017. Activity for the month of March included a deposit of $55 and a withdrawal by check for $50 annual dues covering our chair and vice-chair membership of the GADCC. County Advisory Board updates were given. Robert Wyatt, the Committee’s representative on the Board of Elections and Registration noted that there had been just one meeting of the Board of Elections, on March 24, 2017. The purpose of the meeting was to certify the results of the March 21, 2017 special election, which was a referendum on sales of alcohol on Sundays. Both Sunday sales in restaurants and stores passed by a large majority. This report was given by Pam Davis in Robert’s absence. Chair, Angie Eells announced that a joint event will be held with the ACCD at Live Wire on June 10, 2017 from 4-7. This is a meet and greet for the 10th Congressional district. Angie also announced that the National Federation of Democratic Woman Conference will be held in Atlanta June 8-June 11, 2017. In addition, Angie announced that we now have bumper stickers for sale. They choices are round or rectangular and cost $5.00 each. She also announced that Carolyn Crawford, a committee member, reported that she has volunteered to be the liaison for the Veterans Caucus. Angie also called for a volunteer to be a liaison for the Environment Caucus. The meetings program focused on the development of the four subcommittees. Tracy Wyatt will chair The Candidate Recruitment and Development Committee. Jennifer Gude will chair The Affirmative Action/Membership Committee. There were no newly elected OCDC members. At the June meeting, there are an anticipated five vacancies to be filled on the Committee due to a recent resignation, three Members moving to Emeritus status (Pat Adams, Sarajane Love, Ann Stoneburner ) and our Chairwoman moving to Ex Officio status. 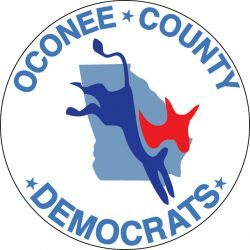 As Emeritus and Ex Officio members, they retain full voting and member privileges, but they intend to provide Committee openings for new Oconee Democrats who have taken on leadership responsibilities with the Committee.